An article on DIY networking written by Panayotis Antoniadis of the MAZI project, is getting global attention through the Huffington Post website, and the Conversation Global, where it was originally published. The article, titled “How to build a more organic internet (and stand up to corporations)” is the second of two articles describing community networks that provide alternative networking solutions, offering internet access to refugees and other communities outside the reach of traditional internet service providers. These DIY networks could be seen as “organic”: they are created by local communities, reflect local culture, and the data they use can be generated and consumed in the same place. The MAZI project is experimenting with these types of local and “do it yourself” networks, for example, the Prinzessinnengarten in Berlin where activists from the Neighbourhood Academy have created a place inside the garden that aims to transfer the principles of organic and collaborative farming to the realm of networking. 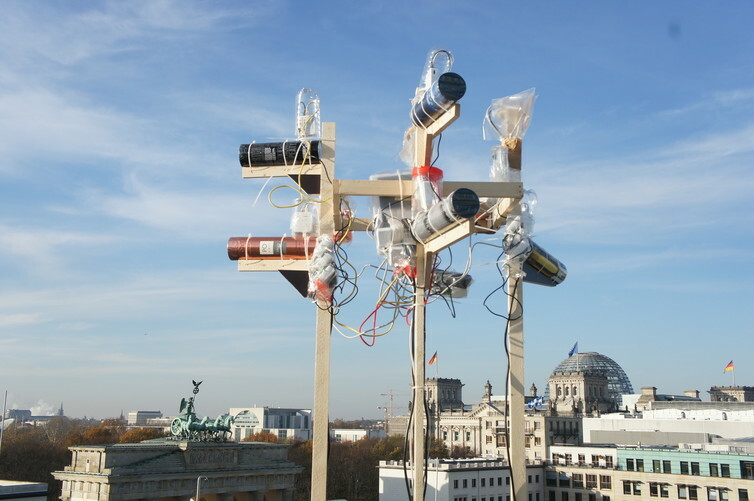 The ‘Can you hear me?’ art installation in Berlin. This entry was posted in Neighborhood Academy, News, Uncategorized. Bookmark the permalink.